Visiting universities is a time-honored tradition that parents get to share with their children who are getting ready to leave home. If you are only looking at one or two schools in an area, it is possible to make these visits happen over a weekend, but if you want to check out a handful of schools in one area, it will take more than a few days. In the greater-Dallas/Fort Worth area, there are many excellent universities, colleges, and other kinds of schools. If your child is looking at schools in the area, book a room at Studio 6 in Plano. We are close to DFW without being in the thick of the city, our rates are affordable, our rooms are comfortable, and the relaxed atmosphere of our rooms can be a great counterpoint to the excitement of the city and the experience of looking at universities. Book your room with us today! Keep reading this blog entry for a few great reasons to stay with us during university visits! If your child has a wide range of schools they are interested in attending, it is a good idea to try to schedule your visits around a single trip, especially if you don’t live in the area. If they want to see as many places as possible, you will need to book a room. At Studio 6, we have rooms that you can book for more than a few days that won’t break the bank. While staying with us is affordable, there is no lack of comfort or amenities. We have free WiFi, a full kitchenette in every room, comfortable new furniture, and business and fitness centers. We even have multi-room suites available so you and your child can have privacy during a long trip. Like many large cities, Dallas/Fort Worth is packed with great colleges and universities. 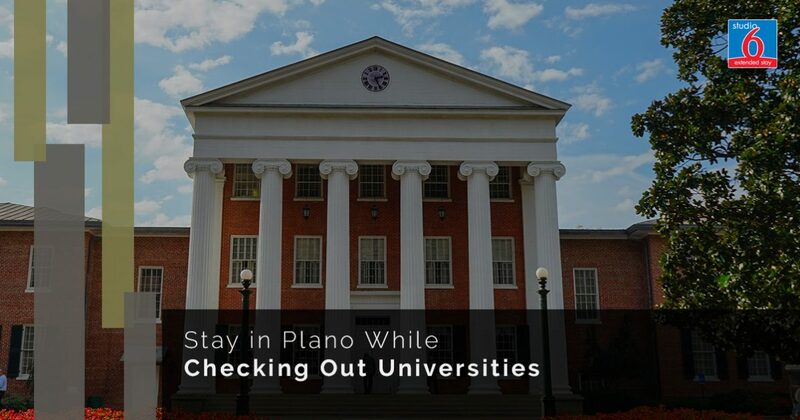 With schools that are a part of the University of North Texas, University of Texas, and Texas A&M systems, there is no shortage of excellent public universities in the area, as well as some prestigious private schools and community colleges. When you stay with us, it is easy to visit several universities in a day without short changing yourself or without being able to get the feeling for a campus. Some campuses will feel like magic right away, while some either won’t be a great fit or will take time to reveal their bright spots. If your child is interested in visiting colleges and universities in the area, there is no better place to stay than Studio 6 in Plano. With newly remodeled rooms, rates that make it possible to stay for as long as you need, and a great location, you really get it all when you book a room with us. Call us today to reserve your space now, or check out the rest of our site for more information about our hotel. We look forward to having you stay with us.